I was in Aichi Prefecture, about a thirty-minute train ride from Nagoya Station, on my way to visit the Momotarō Shrine when, on a whim, I got off at Inuyama Yuen Station. As I emerged, a colorful, flashy, psychedelic building jumped out at me. My first words were: "What the rainbow land?!" The building was painted in the style of Tadanori Yokoo, one of most important graphic designers and artists to emerge out of Japan post-World-War-II. 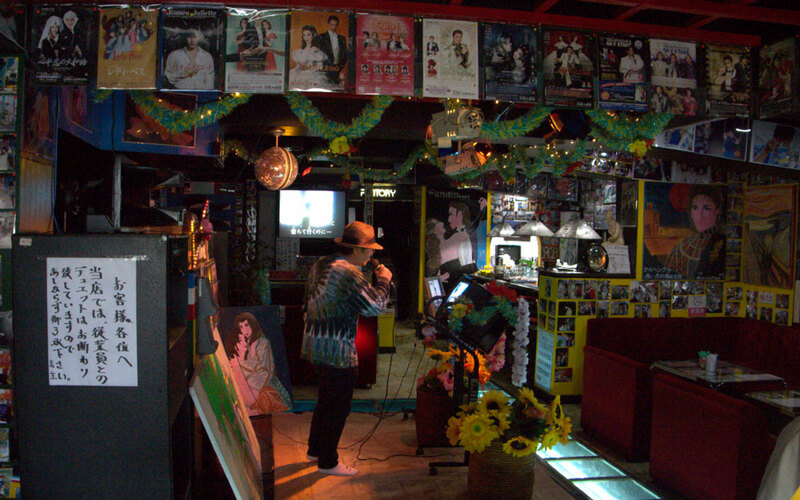 I went to check it out—I had to!—and found a quirky, art-filled karaoke spot: the Million Dollar Café. I actually hesitated a little before opening the door, but a sign said 営業中 (えいぎょうちゅう)—"Open"—so I forced myself inside. I'd thought for a moment it would probably be just a normal café, but I was a million percent wrong. After taking off my shoes and entering, I was amazed to find the place filled with tons of photos and colorful paintings: portraits of famous people, reproductions of Edvard Munch's The Scream, Johannes Vermeer's Girl with a Pearl Earring, and a lot more. As I stood there, taking it all in, the café's owner came up to greet me. His name was Osawa Takeshi (大沢武史). Osawa is a talkative guy. Born in 1941, he opened this long-established café in 1967, when he was only twenty-five. 2017 was its 50th anniversary! 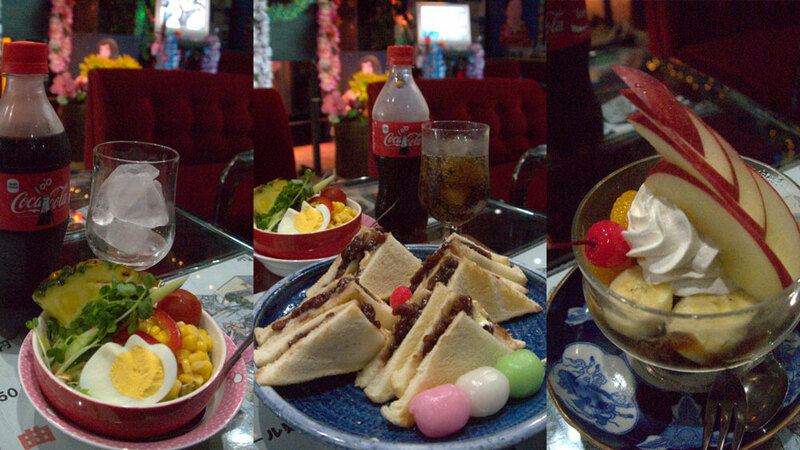 For a long time, Osawa ran the Million Dollar Café as just that—a café. He received a thank-you letter from the Ueshima Coffee Company for serving a lot of UCC's coffee. But there was much more to the story, which is probably best told by Osawa himself. "When I was forty, I met a girl named Junko," he said, by way of explaining the history of the place and the paintings that fill it. "Junko was eighteen and worked part-time at my café. I had a wife before her, but Junko became my common-law partner. Business was going really well. I made good money. When I was fifty-six, Junko and I had a baby boy named Yuki." Osawa went on: "When I was sixty-two, one morning Junko said, randomly, 'I love you. I really love you. I mean it.' It seemed weird, but I didn't think anything of it. But later that morning, she left—I thought she was taking Yuki to kindergarten, but in actuality she took off somewhere with him and left me alone." Osawa hasn't seen Junko, or Yuki, since then. Over the next five years, Osawa was in grief. "I was so upset that I spent an excessive amount of my money on pachinko and at a Filipino pub," he recalled. "I used up all the money I had saved and had none to hire someone to update the Café. "When I was about sixty-six, I needed to repair some paint on the exterior of the building, and I suddenly had an urge to paint my own pictures. I wanted to see my son's portrait, so I painted it. I had never learned how to paint—had never painted anything since I started the café. But the portrait turned out well. It had a genuine likeness to him." 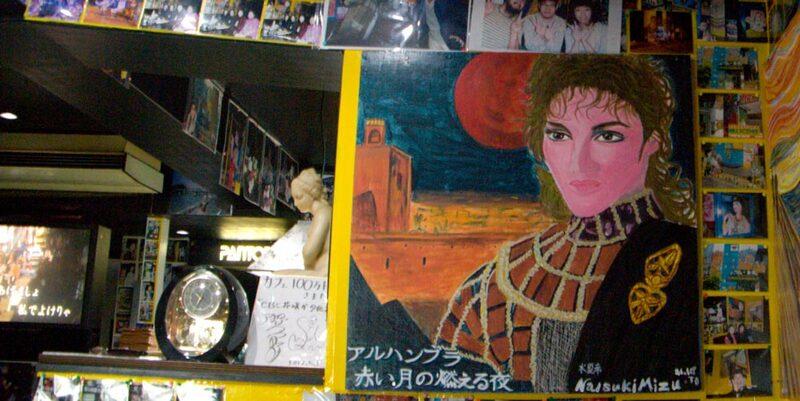 The café is filled with photos of him with Junko, and paintings of his beloved Yuki on the walls. Osawa wishes he could meet his son one more time before he dies. In that moment, Osawa remembered that as a child, he had been good at painting. "I wanted to study art, but my parents told me I couldn't make money at it, so I stopped," he said. "Only years later did I realize that I should never have given it up." 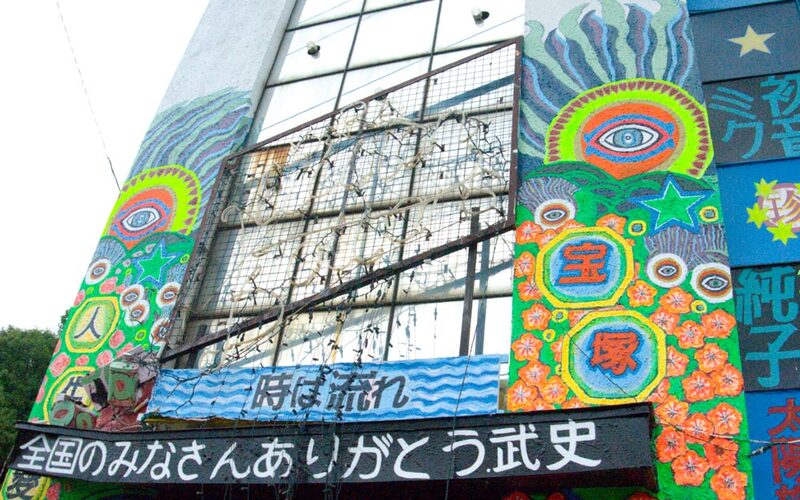 Osawa said he isn't tired of painting now and thinks he never would have been. "I don't plan out what I want to paint next," he explained. "I paint whatever pops into my head. Painting saved my life. Without it, I might have killed myself." 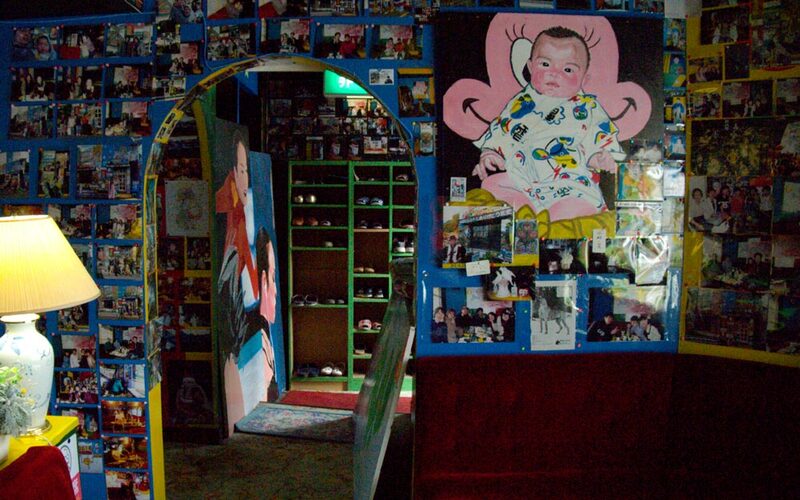 The café is filled with photos of him with Junko and paintings of his beloved Yuki on the walls. Osawa wishes he could meet his son one more time before he dies. 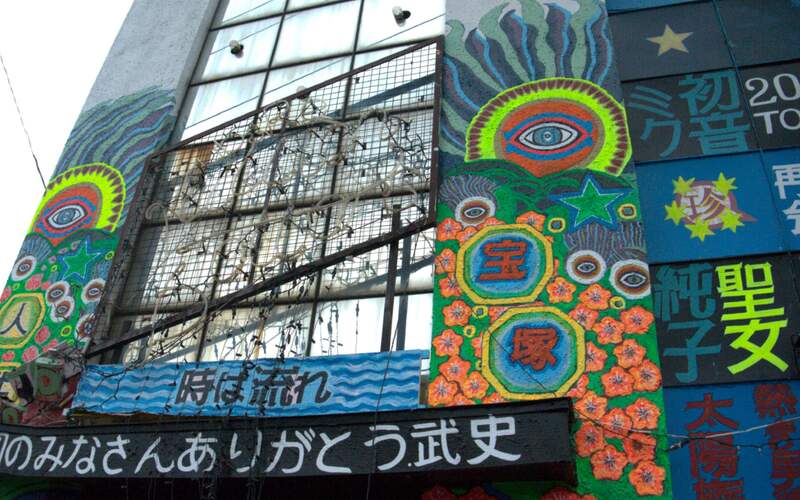 The kanji 聖女純子 (せいじょじゅんこ) outside of the building mean "Saint Junko"—they express his love for the mother of his child. The Million Dollar Café is filled with its owner's love, his personal history, his likes and dislikes, and whatever else dances around in his mind. This dragon, for example, was from a dream he had when he was in first grade. He often dreamed of a dragon flying toward him—so often that sometimes it gave him sleep paralysis. 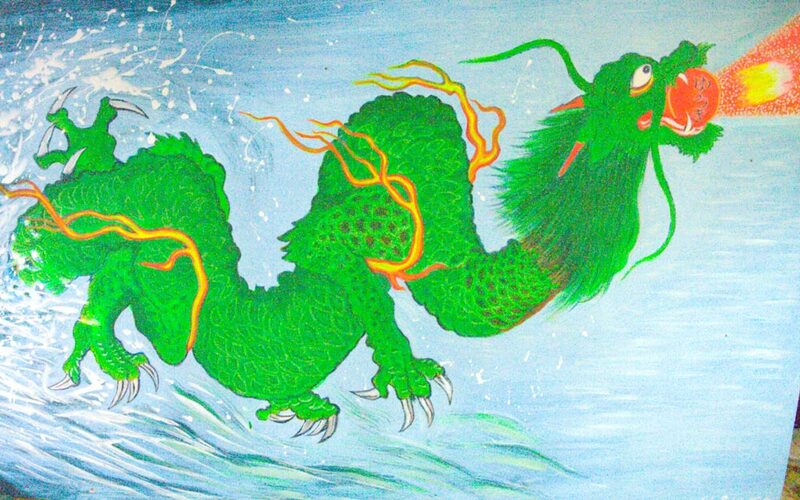 As an adult, he wanted to paint the dragon that had visited him so many times at night. As an adult, after painting a trio of dragons, Osawa began to dream at night about what he called the "Revelation of God." He said that the original dragon he painted molted from within to become an entirely new dragon. In its third molting, he explained, the dragon turned into God. One of Osawa's customers named the room with the dragon pictures in it the "God Room." The café seems to draw a large amount of goodwill. 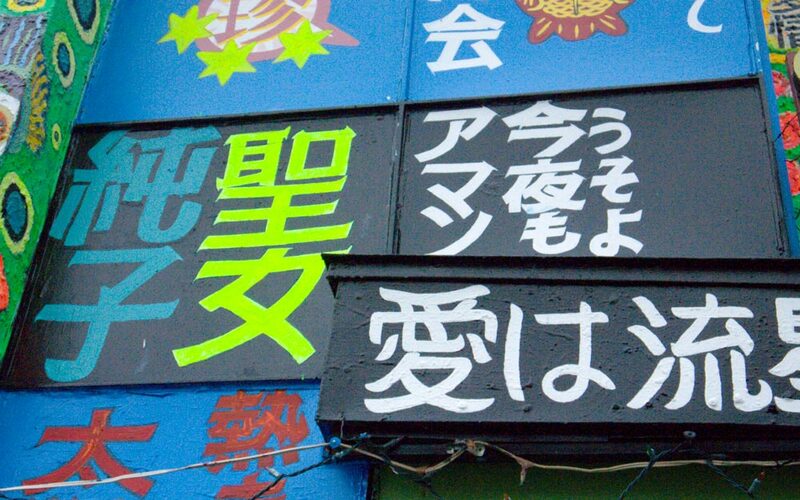 This sign, created by Osawa, reads, "Thank you to everyone nationwide. By Takeshi." He painted it after volunteers from all over Japan came to the region to fix Momotarō Shrine—and came to his café for the after-party. He also painted 初音ミク, Hatsune Miku, because he likes her, but also because an otaku once arrived in an 痛車 (itasha) with a Hatsune Miku-themed paint job. He painted his interpretation of what he thinks Miku is really like, giving her two eyes embedded in colorful circles with seaweed coming out of them. It's a little weird, to be honest, but harmless. After chatting with Osawa about the art, I placed an order. Since I was in Aichi, I figured I should order Ogura Toast—thick-cut toast with sweet red bean paste. It cost ¥500. Yet the first thing that came to my table was a salad. I was like, "Huh? ", but Osawa told me it was on the house. A Coke was delivered next. I didn't order it either. Again I was told, "It's on the house." It turns out that Osawa really does serve this much food to everybody; I wasn't getting freebies just because he knew I was planning to write about his business. The other customers had a ton of food on their tables too. When I got my ogura toast, I was surprised at how many slices there were! The dish also came with hanami dango. How generous! But it didn't stop here. After I finished my toast, a sundae appeared. Again I was told that it was on the house. Osawa asked if I drank alcohol. I said yes. He brought me a glass of wine, even though it was 9:30 in the morning! He said that Junko had surprised him with wine one morning, so he likes to offer it to his customers sometimes. At the Million Dollar Café, when you order a drink, you get to sing one karaoke song for free. While I was there, a customer was already singing—again, this was early in the morning! 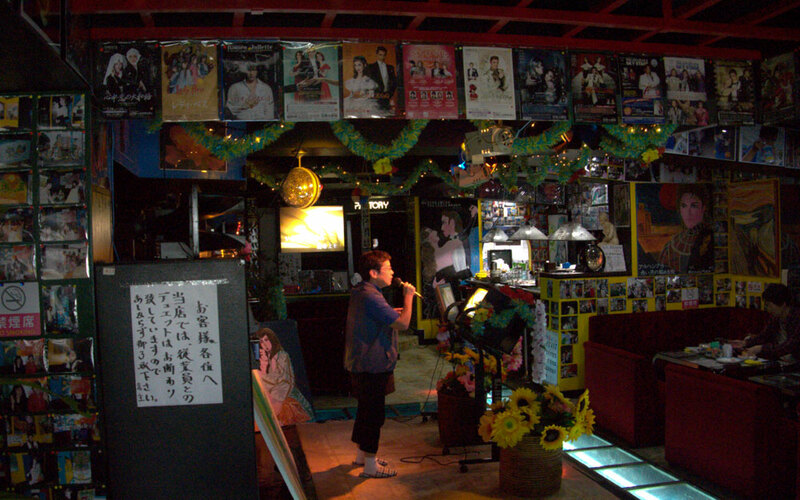 Although he has a notice prohibiting customers from singing with staff, Osawa himself suddenly started singing too. Maybe it was the free morning wine, but I was starting to appreciate all the freedom in this place! When I went to pay my tab, it was only ¥500. I tried to pay more, but they refused to take it, as well as any tip. I got excellent service and really enjoyed myself. When I was leaving, Osawa gave me a can of beer as a souvenir. I asked him how he can afford to be so generous while still trying to make a profit. "Profit?" He scoffed. "I calculated once, but I only found out that I don't make any profit. So I stopped calculating. I want to make my customers happy, even if I use up all my pension from the government. I'm sending my love to people from here." 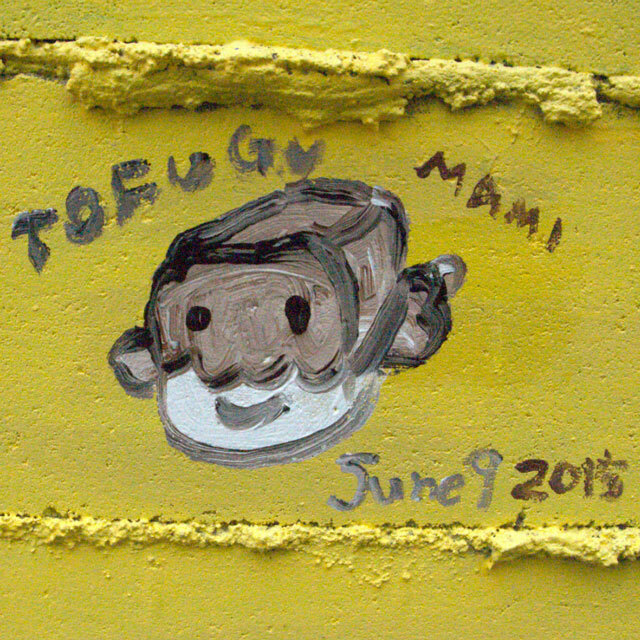 Before I left on my way toward Momotarō Shrine, Osawa let me paint a little Tofugu on his wall. This was my second time: the first was at Rakugaki Tonkatsu bar in Kyoto with Aya, Tofugu's illustrator. I wished Aya was with me again: I definitely need practice! Even though the story of Junko and Yuki was very sad, Osawa was an interesting, generous, and colorful character, and my visit to his Million Dollar was a fun and unique experience worth way more than ¥500. I’ll definitely go back some day. 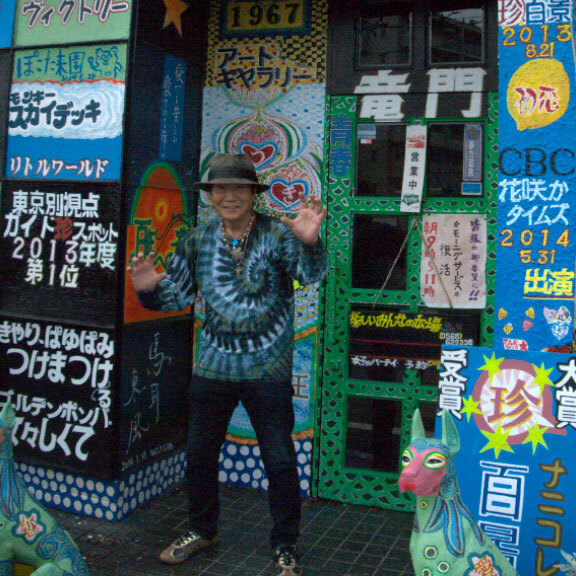 If you ever come around Inuyama, seek out its crazy rainbow façade—and make it a point to step inside.